Ecuador’s Mashpi Lodge is inviting pedal-pushers and their possibly less-energetic companions to enjoy a toucan’s-eye view of the surrounding cloud forest. National Geographic-affiliated Mashpi’s attractions include the Sky Bike, which has cloud forest explorers travel for some 200 metres both through and above trees two at a time, with one person propelling the cable-affixed carriage by pedalling, while a fellow voyager is free to relax and take in a lofty view. 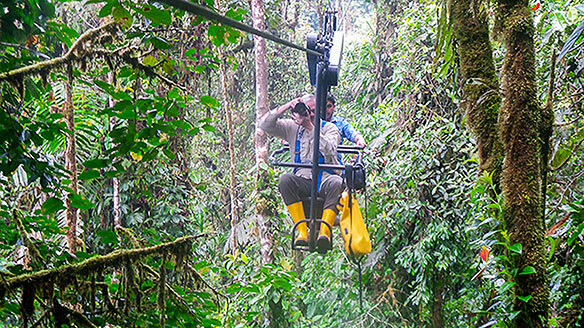 Mashpi consultant Beno Atan says Sky Bike riders – the pedaler sits directly behind the other guest – will find themselves in a birdwatcher’s “heaven,” with the surrounding forest sheltering a huge number of our feathered friends. Both riders are harnessed in in a journey that takes them from one platform to another, reaching elevations of up to 60 metres. more physically challenging for the pedaller than the beginning, as the carriage has to work its way upward to complete the trip. The trip begins with a descent. “It was a workout,” says adventurous Easter Island native Atan, who has travelled throughout much of South America, thanks to his work with remote lodges. “You use the same muscles [used in regular cycling], but the experience is different,” he says, adding Sky Bike rides shouldn’t be viewed as a race. Some Sky Bike riders are nervous, and those tasked with pedalling may find the trip a little too grueling, in which case they can raise a arm to signal they need help and then have Mashpi staff pull them in via the cable. Mashpi guide Nestor Paladines says staff at times will gently suggest to some clearly out-of-shape guests hoping to pedal that they’d probably be better off with the more relaxed seating option. “You can have a little adrenaline but it’s a way to enjoy the forest,” Atan adds. More information is available at Mashpi.com . Among airlines serving Quito is Panamanian carrier Copa, which includes Montreal and Toronto in its network.